We offer many different options when it comes to providing you and your family with our pasture raised premium meats. We began raising meat for ourselves because we wanted to know where our meat came from and what went into it (and what didn't!). We raise all of our animals on pasture without added hormones or any medications to help them grow faster. We know everyone doesn't have the opportunity to raise their own, but that doesn't mean you can't know where your meat comes from! Please see the meats we offer below. We also offer full or half animals available for custom processing. We'll transport the animal for you and you can have it processed exactly to your specifications. We'll even help you understand the forms to fill out if you've never done them before. Please contact us for pricing. Currently we offer pork and chicken. We will soon be offering beef and goat. 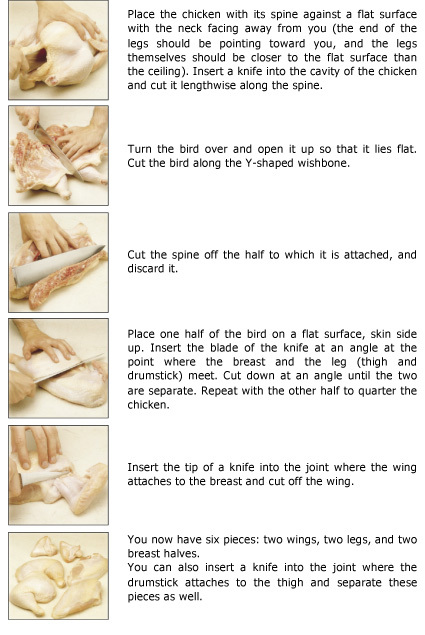 We offer our chickens whole; below is a diagram showing how to cut a whole chicken. 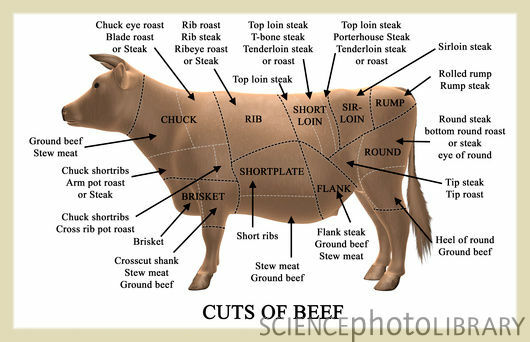 Below, we've also added diagrams of the common meat cuts for the meats we offer. Hope this helps you in your meat selection. If you have any questions about cuts, please feel free to contact us (as always! ).